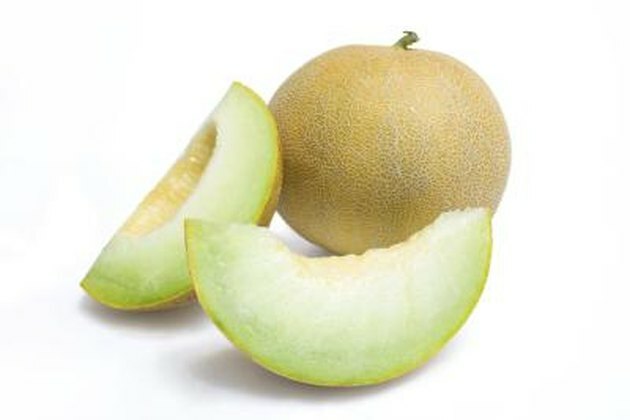 Honeydew is a member of the melon family of fruits and usually has pale green sweet and juicy flesh inside a hard rind. Honeydew melons are a nutritious addition to your diet because they contain several vitamins and minerals. With only 60 calories per half cup, honeydew is a nutritionally beneficial fruit to add to your menu. A potassium deficiency can result in an irregular heartbeat or an inefficency at pumping blood throughout your body. Many fruits supply a good dose of potassium and a 1-cup serving of honeydew will provide you with up to 8 percent of what you need each day. The water-potassium ratio on honeydew may also help prevent an increase in blood pressure. Add some cubed honeydew to your breakfast or lunch as a healthy side dish or mix with cantaloupe and watermelon chunks to create a mixed melon fruit salad. Healthy skin and collagen rely on an adequate consumption of vitamin C and honeydew supplies you with a good dose. A 1-cup serving of honeydew will provide about half of your daily vitamin C needs. Vitamin C can also boost your immune system so you can help prevent illness and infection. It strengthens your tissues, such as your blood vessels and bones, and promotes brain function. Copper is essential for healthy skin because it helps aid in skin cell regeneration. Honeydew is a good fruit source of this trace mineral. Your body's ability to repair its muscles and tissues also relies on a sufficient intake of copper and adding honeydew to your diet may help you increase your levels of this important mineral. In addition to supplying potassium, vitamin C and copper, honeydew is also a good source of several B vitamins, including thiamine and niacin. B vitamins help your body get rid of toxins that can cause illness and disease. B vitamins may also reduce your risk of heart disease and Alzheimer's disease.